Swandre the Giant showed just how powerful he was, taking the $85,000 Indiana Sires Stakes final Wednesday, Oct. 3 at Hoosier Park. The Swan for All two-year-old scored a gate to wire win in a time of 1:55.3. Driven by Yannick Gingras, Swandre the Giant hustled out of the gate for the top spot from post four, placing his rival It’s A Herbie and Verlin Yoder right at his back through the entire mile. The freshman trotter did get a slight breather during the middle half of the race before powering home in :28.3 for the two and one-quarter length win over It’s A Herbie, who was well in hand for second. Airman Kelly and Trace Tetrick fended off the rest of the field for third. 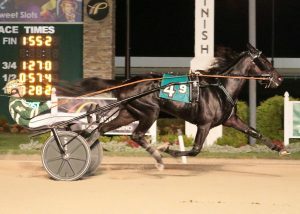 It was the ninth career win for Swandre the Giant, who was purchased by his current connections of Diamond Creek Racing, J & T Silva Stables, Inc. and Howard Taylor following his seven-race win streak at Hoosier Park for trainer-driver Brandon Bates. The striking colt is now trained by Jimmy Takter. Swandre the Giant topped the $200,000 in career earnings for his win in the Indiana Sires Stakes Final. The Indiana Standardbred Association presented a blanket to the winner, who will now gear up for the $200,000 Super Final slated for Friday, Oct. 12, which is Hoosier Champions night at Hoosier Park. Earlier in the day, Freaky Feet Pete was back on track, earning a win in qualifying action. Driver Trace Tetrick raced the now six-year-old son of Rockin Image pulled away from the field in the stretch for a final panel of :27.2 to stop the timer in 1:53.4. It marked his third qualifier of 2018 in his comeback to the races for the Rheinheimer Family.